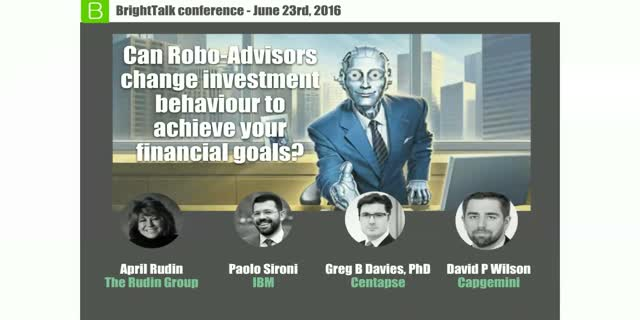 Can Robo-Advisors change investment behaviour to achieve your financial goals? The Wealth Management industry is at the center of a digital earthquake, which is tearing the fault apart. On one side of the fault, the family of the taxable investors is changing the behaviour with regards to personal finance. On the other side technology is transforming the way individuals access investment solutions and personal advisors add value. The rise of Robo-Advisors has been broadly welcomed but also generated concerns about the effective advice that individuals can receive by means of digital tools. Starting from Paolo Sironi's upcoming book "FinTech Innovation: from Robo-Advisors to Goal Based Investing and Gamification", April Rudin will invite a qualified panel of experts to discuss and think about the links between how we use technology to invest and save, how to change our investment behaviour to make best use of digital solutions, as well as how to improve our knowledge to achieve a more balanced and informed approach about our financial health to become effective in using social media engagements and content. On this changing landscape, educational gamification could provide an opportunity to use technology and help individuals to learn how to think in terms of goals, re-wire their investor's brains for the good and change the way they react to financial new, market drops and life events. Title: Can Robo-Advisors change investment behaviour to achieve your financial goals?